Miru 1 month Multifocal are monthly multifocal contact lenses for the correction of presbyopia.They are made of a silicone-hydrogel material. They provide a sharp vision at all distances due to the combinations of optic zones that flow smoothly into one another. 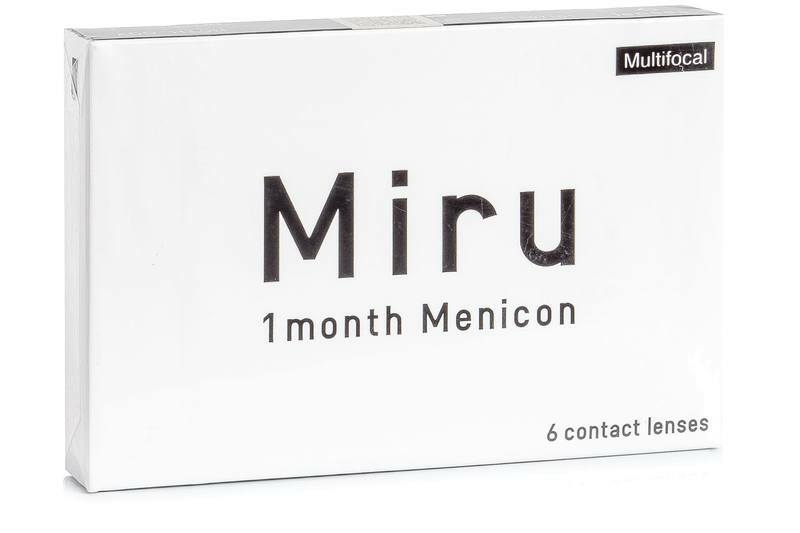 Miru 1 month Multifocal contacts are designed for daily wear with a monthly exchange period, and they are specifically designed to reduce dry eye syndrome. Their name is derived from the Japanese word miru – “to see”. The lenses have a transparent dye shade to help make the handling easier. Unique silicone polymerization and innovative hydrophilic monomer, MeniSilk™ technology delivers one of the highest levels of oxygen transmission (Dk/t) of any commercially available disposable lens. Higher oxygen transmission ensures that every part of the eye gets the maximum amount of oxygen, and thereby healthier eyes. Unique surface technology and nanometer precision. Miru 1 month Multifocal lenses have one of the highest oxygen permeabilities, and thanks to the applied MeniSilk™ and Nanogloss™ technology, they provide extra hydration and comfort. The advanced technology used in Miru contacts makes a perfectly smooth surface that improves hydration, reduces lipid and protein deposits, while minimizing bacterial deposition. Miru multifocal contact lenses are available with LOW and HIGH additions. The manufacturer recommends LOW for users with addition +1.00, and HIGH for users with an addition from +2.00 and on.